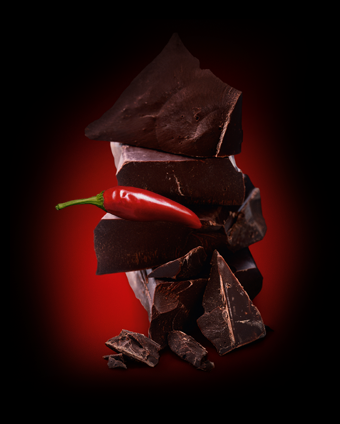 Chocolate and chili. Just trust me. I often cook with chocolate stout. Sometimes I even put it in the food. The Mesoamericans of Central America fermented cacao pods to make chicha, a drink analogous to beer. However, a recent archaeological study suggests that chocolate was first produced as a by-product of beer. Fermentation is necessary to produce the flavor compounds we know and love, such as theobromine. A recent archaeological study found pot shards were found by in a ruined ancient village in the Ulúa Valley in Honduras dating from 200 BC to before 1100 BC. Chocolate residues containing theobromine were extracted from the pores of these pot shards, suggesting the involvement of fermentation. This led the investigators to speculate that cacao beer might have been the originating process. The transition from beer to chocolate may have come when ground cacao seeds were added to the beer, making a thick unsweetened beverage. While the subtle sweetness makes it easy to use in desserts, the rich chocolate malts are perfectly at home with dark meats and sauces. You don’t need to follow a recipe if you know what flavors complement each other. Pay attention to the balance of flavors. Sweet, salty, sour, bitter, and spicy. In this chili, the chipotle peppers are salty and spicy, with a hint of acidity from the lime to cut the heat. Chocolate and stout add a complex bitterness that ties it all together. I don’t think I’ve ever made chili the same way twice, but I may now make an exception. Chili night! With roasted garlic bread. Heat oil in a large heavy pot. Cook the onions and garlic cloves over moderate heat, stirring frequently until the onions are softened. Add the ground beef and cook the mixture, stirring and breaking up the lumps, until the meat is no longer pink. Finely chop unsweetened chocolate. Add to pot along with beans, chipotle purée, and spices (cumin, chili powder, black pepper). Simmer uncovered for 5 minutes. Grate lime zest and squeeze juice from lime. Add to pot along with tomatoes (diced, crushed, and sauce), and stout. Add salt and liquid smoke to taste. Cover pot and allow to simmer for 20-30 minutes. The chili may be frozen or kept chilled for up to 3 days.